Refocus of smartwatch by Apple: Defeat, retreat or new way to compete? Apple has refocused its smartwatch on the fitness market, a move analysts believe was prompted by the company's recognition that the broader definition it has used was simply not making the grade. "They're responding to what's working, what's resonating with customers," said Jan Dawson, chief analyst at Jackdaw Research. Dawson and others were reacting to the shift in Apple's portrayal of the upgraded Watch, dubbed "Series 2," during last week's launch event that also included the iPhone 7. Virtually all of the stage time about the new Watch, and many of the new features the Series 2 model sports, related in some way to fitness, from its water resistance, which an executive touted as "swim-proof, and GPS tracking to a new Nike-branded model. That was significantly different than the opening salvos of the Watch two years ago when the Cupertino, Calif. company introduced the wearable. Then, Apple dipped into the iPhone playbook to trumpet a trio of primary use cases: for notifications forwarded from an iPhone, for telling time, and as a fitness accessory. "It's still a timepiece, but communications have totally faded into the background," said Dawson, who added that Apple has also played down the original narrative around the potential of the device's app ecosystem. Instead, Apple trumpeted fitness, health, and more fitness. It's not unusual for consumer technology, or any product, to morph from its original vision to something less inclusive. And the route from introduction to success, if the latter is a made milestone, is almost never straight. But the change from something that was to appeal to multiple audiences -- including fashion insurgents -- to a less-ambitious one-play pony makes one wonder if the retrenchment hints at defeat as much as flexibility. The origin of the former stems from estimates of slumping smartwatch sales, those guesstimates necessary because Apple refuses to reveal numbers. In July, researcher IDC pegged second quarter Apple Watch sales at 55% below the same period in 2015, for instance. Analysts at the firm, however, put a bullish spin on their 2017 forecast, predicting a 46% increase in smartwatch sales next year. Jack Gold, principal analyst at J. Gold Associated, viewed the fling with fitness as a necessary turn, pointing to those estimates to argue that sales did not exactly boom under the original concepts. "From a marketing positioning perspective, it makes more sense to have a purpose-built solution than a general-purpose device," said Gold. "[The general-purpose device] certainly didn't sell as Apple hoped." Apple hasn't been the only smartwatch maker to scramble and struggle, Gold contended. "I think the whole market is still searching for what a smartwatch is going to be," he said. "What does it become? I'm not sure that any of us know." Some pundits believe the inevitable destination of the smartwatch, Apple's in particular, is as the replacement for the smartphone, reached when the wrist worn device gets its own cellular modem and a battery long-lived enough to power the device for a day. Maybe. Paths to various futures are regularly paved with the corpses of predictions that died unremembered. In the meantime, if that meantime becomes the spelled-out future, Apple must do something to keep the Watch tickin' and kickin'. For Gold, the move toward fitness was smart, and not simply because that application was the one that seemed to ring loudest with customers. It also let Apple edge the Watch, or the perception of the Watch, from the original image as an iPhone accessory to one of unattended competence. 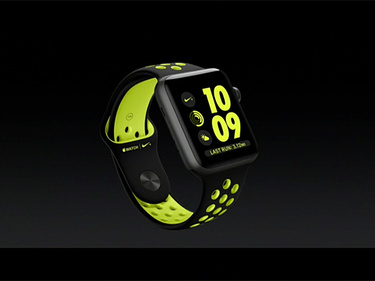 "They're playing up the stand-alone idea," Gold said, ticking off the Series 2's new features. "GPS tracking, walking, jogging and swimming ... it's no longer an iPhone peripheral only. It's now more." And the fitness pivot, while perhaps a retreat from the bigger dreams of 2014, doesn't mean that Apple's lost the war, argued Dawson. He imagined the device's trajectory as an hourglass shape. "The original idea of the Watch was very broad," Dawson said. "It has the potential to broaden out again, to become another small computer. On paper, it still is that."